Effective design, analysis, and integration of steam turbines can help optimize steam supply reliability and overall energy efficiency across your plant. Steam turbines are important components of process plant utility systems. They offer opportunities for optimizing steam supply reliability, as well as site-wide energy efficiency. Steam turbines are most common in the oil refining, ammonia and urea, methanol, ethylene, and pulp and paper industries, where they are generally sized to produce 10–60 MW of power. Good economics are also possible at smaller sizes as low as 2 MW, which are more common in the food and beverage industries, as well as in small to medium-sized plants in the chemical process industries (CPI). Achieving favorable steam turbine economics depends on choosing the right type of turbine (e.g., backpressure vs. condensing) in the right size, as well as integrating it correctly with the heat exchanger network (HEN) in accordance with the appropriate placement principle of pinch analysis. This article reviews the thermodynamic relationships and equations that link steam flow conditions and power output, which are useful for estimating preliminary economics of new turbines and analyzing the performance of existing units. Any device that converts the chemical energy contained in a fuel into mechanical energy (i.e., shaftwork) via combustion is called a heat engine. Heat engines are generally classified according to the thermodynamic cycle that they follow. The most common heat engines in industrial applications are steam turbines (Rankine cycle), gas turbines (Brayton cycle), and internal combustion engines (Otto cycle). ▲Figure 1. Steam turbines come in many different configurations, including (a) backpressure turbines (BPSTs) operated in cogeneration mode and (b) condensing turbines (CSTs) for power generation. Hybrid configurations, such as (c) extraction turbines and (d) induction turbines, are less common. Pure BPSTs are used mostly in industrial facilities that operate continuously, where the goal is high thermodynamic efficiency and the energy demands are relatively stable. They are typically sized for 3–60 MW. Condensing steam turbines (CSTs) exhaust steam to a condenser at atmospheric pressure or the lowest possible pressure at which it can be condensed with the available cooling utility (Figure 1b). In locations with a ready supply of water, cooling is usually accomplished via a closed loop that circulates through an evaporative cooling tower. In arid regions, such as the Middle East, North Africa, and the Southwestern U.S., air-cooled heat exchangers are usually more practical than wet cooling towers. Utility power plants use CSTs exclusively because their objective is to maximize power generation and there is no use for exhaust heat from BPSTs in the Rankine power-generation cycle. Power plant CSTs are typically sized in excess of 100 MW and have heat rates of 11,000–16,000 Btu/kWh, depending on factors such as the pressure and temperature of the inlet steam, the temperature of the cooling medium, and the turbine isentropic efficiency. Extraction-condensing turbines (ECTs) are hybrids, in which some of the exhaust steam is extracted at pressures high enough for process heating (cogeneration mode) and the rest is condensed by a cooling utility for power generation (noncogeneration mode) (Figure 1c). ECTs are less common in industry, because they are more expensive to buy and maintain and are more difficult to control. Induction turbines are hybrids that offer very high system efficiencies, because they extract power from steam that would otherwise have to be let down in pressure through a throttling valve (Figure 1d). They typically receive two sources of inlet steam at different pressures (e.g., high pressure and medium pressure) and exhaust at a single lower pressure (e.g., ambient pressure or vacuum). Figure 1d illustrates a simple case in which an induction turbine would be appropriate. The process is exothermic and generates more LP steam than is needed for process heating duties, but it needs high-pressure (HP) steam for other higher-temperature duties. With only two steam pressure levels, the required amount of HP steam is sent straight to the processes that need it, while the surplus exhaust from the turbine is condensed by a cooling utility for additional power generation (noncogeneration mode). Induction turbines are even less common than extraction turbines, because they are more expensive to buy and maintain and more difficult to control. The expansion process that occurs in a properly insulated steam turbine is essentially an adiabatic process. The enthalpy difference between the inlet and exhaust steam (neglecting frictional losses) is almost fully converted into mechanical energy, which can then be used to drive a pump, a compressor, or an electric generator. This process can be followed on an enthalpy-entropy (H-S) diagram, known as a Mollier chart. In the example diagram (Figure 2), the path from Point 1 to Point 2 represents typical BPST operation at a chemical plant, pulp and paper mill, oil refinery, or food processing facility; superheated 600-psig steam at 700°F (Point 1) expands as it passes through the turbine and is exhausted at a pressure of 50 psig (Point 2). The path from Point 1 to Point 3 represents CST operation with the goal of maximum power generation to minimize the need for imported power under normal operation or to compensate for temporary loss of imported power from the grid. HP steam is exhausted at vacuum conditions and is condensed against a cooling utility. ▲Figure 2. 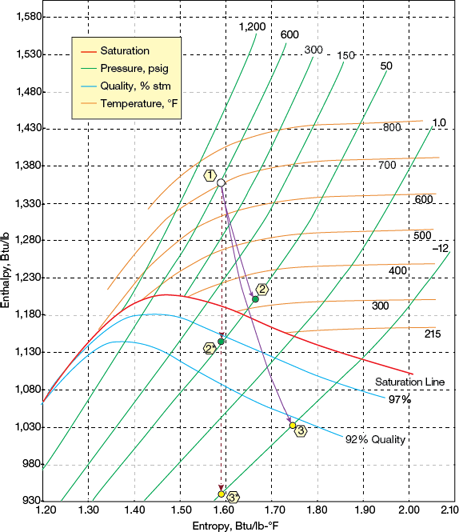 The adiabatic expansion of steam in a turbine is most conveniently represented on the enthalpy-entropy (H-S) Mollier diagram. Point 1 = turbine inlet, Point 2 = low-pressure exhaust for process heating (cogeneration mode), Point 3 = exhaust to utility condenser (power-generation mode). Steam turbines typically rotate at 3,000–15,000 rpm. At that speed, water droplets can form and unbalance the turbine blades, causing severe mechanical damage. BPSTs can usually operate safely at up to 3% moisture (i.e., a minimum steam quality of 97%). CSTs specially designed for utility-scale power plants can handle as much as 10–12% moisture. Process plants should avoid normal operation at this limiting condition, and should aim to stay at least 20°F above the exhaust steam dewpoint. where H1 is the enthalpy of the HP inlet steam (Btu/lb), H2 is the actual enthalpy of exhaust LP steam (Btu/lb), and H2* is the enthalpy of the exhaust LP steam assuming isentropic expansion (Btu/lb). where W is the work output (kW), M is the mass flowrate of steam (lb/hr), and 3,412 is the approximate conversion factor to convert Btu to kWh. The isentropic efficiency cannot be determined exactly, but it can be estimated fairly accurately using empirical correlations based on historical industry experience, which are usually available from steam turbine vendors. When purchasing a steam turbine, it is good practice to require all bidders to provide values of ηT for each machine over the range of expected load conditions. Monitoring an existing turbine’s efficiency loss can provide advance warning of impending turbine problems. where a and b are functions of W (Table 1). Determining the values of a and b from Table 1 requires iteratively calculating the difference between the saturation temperature at the inlet (Tsat,i) and outlet (Tsat,o) in degrees Celsius (ΔT).